As a member of the police force, Chief Inspector Peninah Kamicha knows what a loaded firearm is and especially what it can do in the wrong hands. 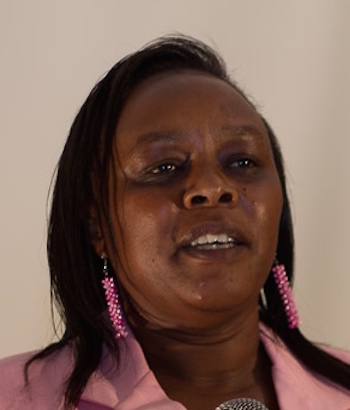 Stationed in Nakuru County, she went into action when she heard that one of her officers was recklessly threatening to shoot and kill everyone along Oginga Odinga Street. She rushed to the scene despite the risk, pinned the officer down and disarmed him before reassuring the public of their safety. It was later determined that the officer in question was drunk and therefore with impaired judgment. Chief Inspector Kamicha risked her life selflessly, not just because it was her job, but because she values life and the well-being of the community as a whole. She stands out as our hero today; if not for her taking the effort and risk to disarm this officer, many lives could have been tragically lost. Giraffe Heroes Kenya wishes to recognize Peninah Kamicha for ‘sticking out her neck’ for the common good and her desire to lighten the loads, strengthen the hearts, and improve the lives of those in his circle of influence.